▲배경사진= 유콘 강변의 유콘 주도 화이트홀스. 사진=Wikimedia.org. 좌측=유콘 준주기. 우측=1890년 유콘 준주 골드러시 당시 등록 대기 중인 광부들. 사진=캐나다 문서보관소. 1890년대 골드러시로 수천 명의 광부가 유콘에 당도했고, 이 모습을 로버트 W. 서비스는 시로 찬양했다. 광산은 경제에서 여전히 중요한 부분으로 남아있다. 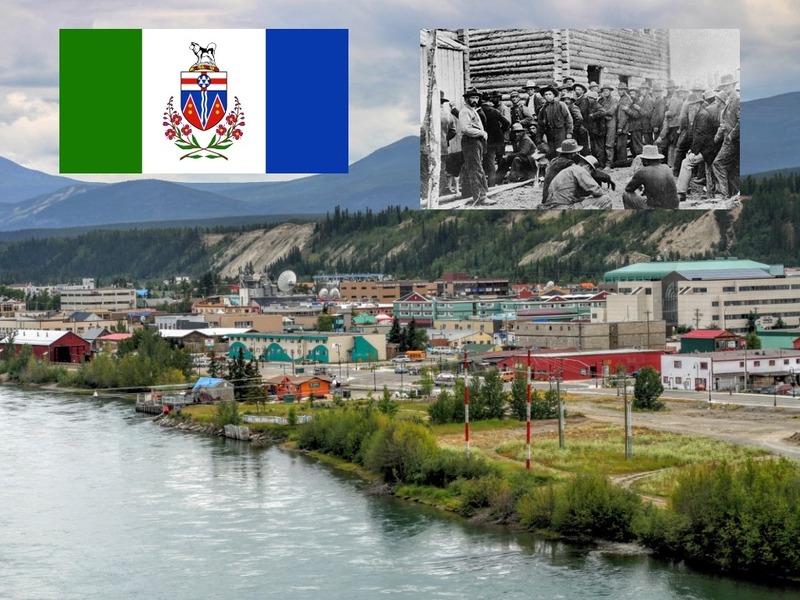 Thousands of miners came to the Yukon during the Gold Rush of the 1890s, as celebrated in the poetry of Robert W. Service. Mining remains a significant part of the economy. 화이트 패스와 유콘 레일웨이는 이웃 알래스카의 스캐그웨이부터 준주 주도인 화이트홀스까지 1900년에 열려서, 깎아지른 벼랑 샛길과 교량을 통과하는 장엄한 풍경의 유람 경로를 제공하고 있다. The White Pass and Yukon Railway opened from Skagway in neighbouring Alaska to the territorial capital, Whitehorse, in 1900 and provides a spectacular tourist excursion across precipitous passes and bridges. 유콘은 캐나다에서 가장 추운 곳(-63℃) 기록을 보유하고 있다. Yukon holds the record for the coldest temperature ever recorded in Canada (-63°C).